This canvas depicts Johnny Gaudreau in a Flames third jersey. Gaudreau was voted into the 2019 All-Star game, making it his fifth All-Star game in a row. 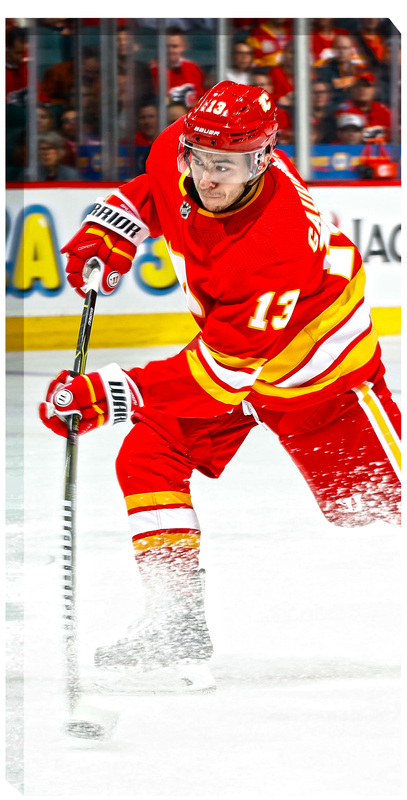 Gaudreau is entering the 2019 All-Star game with 29 goals and 73 points through 51 games, tied for second in points in the NHL. Gaudreau has 361 points in 363 games in his five year career. This unique art print is officially licensed by NHL & NHLPA. The image has been printed on a canvas and is stretched and stapled on the back to a 3/4" deep wooden frame. Perfect for any home or office and a unique addition to any hockey collection. FINISHED SIZE 14" x 28"